The String Emporium specializes in the upright bass. 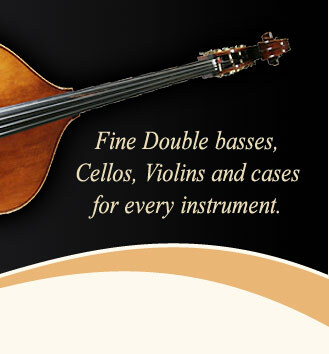 We pride ourselves on offering only the very best upright basses. For every price range, whether it is for a super affordable Thompson plywood bass ($1,485), a Thopmson Hybrid (with carved top), or our famous fully carved Wan-Bernadel, Rogeri basses that we offer, we have the best quality instrument (most value for your money), in ever price range. The best way to explain this, is that for every price point, our basses and prices will always be far better than anything else in that range. For our plywood bass, one will not be able to find a same top quality, for under $2,000, that we only sell for $1,485, with our same, full professional set up and high quality parts and strings. All of our new basses, are made exclusively for String Emporium and so we are able to offer bigger discounts to our customers. Even for our other brands that we offer, Shen, Wilfer, Pollman, our prices will always be much more competitive here. When customers combine our competitive prices and then see and play how we set up our basses here (even our lower end ones), they are always happy with the results. Every bass that leaves our shop is guaranteed to be of the very highest level. String Emporium is your "One-Stop Bass Shop"
Great quality basses in every price range and level. Bass bows, of high quality. Even our affordable entry level S.E. Brazilwood bow is made exclusively for us which offers a high quality 'useful' bow. Our bass strings are very competively priced which we still have the lowest prices in the world. Some pages require password entry, but that is because of our special (low) price points. Every instrument, bow, and accessory that we offer is time tested for high quality, usefulness and affordablity. We will only sell products that we here as professional bass players ourselves, would want or use: No junk, no matter how cheap, we will never offer here. Need a good bass cover and one that will not damage your bass? We sell 3 or 4 different bass covers (cases) here as well as just about everything, bass related, that a professional player or serious amateur will need. One Stop 'Bass' Shop? Even our sheet music has a vast selection. We offer just about every printed piece of bass music, from solo bass, to bass quartets(!) to our vast stock of bass study methods. All are here! We welcome our customers to call anytime they need help or more information as even the best musicians and the highest level professional bass players can sometimes get confused about something bass related. Just call, we'll help (800-600-2689). 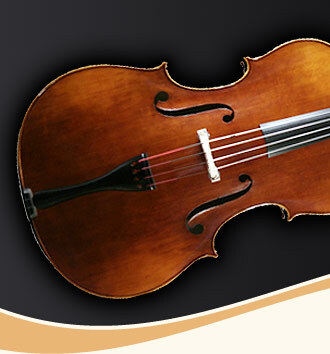 In addition to our lower pitched family, we also offer fine cellos by Émile Gillet and have the best selection of instrument cases for violin, viola and cello which include manufactures Eastman, Bobelock and Bam, just to name a few.